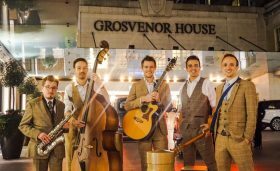 Hailing from Yorkshire this Mumford and Lumineers style band are available for vintage folk style weddings in and around the North of England. Babel can provide an acoustic roaming or static electric set ( even a bit of both! ) They are an experienced collective of musicians ready to provide you the best wedding or corporate event entertainment around. They have performed at many venues across midlands and the North in locations such as: Leeds, Manchester, Bradford and Sheffield. They never cease to amaze the crowd with their close up, table to table performances and finish in a lively on stage set that will keep the audience on their feet for the rest of the evening. Jo Richards, Blindhouse press, Leeds. Previous venues and events include Wimbledon Tennis Championships, Chillon Castle & Lake Geneva (Switzerland), The Ritz, The Langham, The London Boat Show, Grosvenor House, The Ham Yard Hotel, Hampton Court Palace, The Silver Sturgeon (luxury river yacht), Altitude 360, Supernova, Isola Del Garda (Italy) plus countless luxury wedding venues nationwide. Performances for Jaguar Land Rover, Help For Heroes, James Caan (Dragons Den), Taylor Wessing, Rabobank, Atos, Merrill Lynch, Epson, Kuoni, Kwik Fit, WH Smith, World Television & many more. Why hire BABEL ROAMING Band? With may years of performance experience at Weddings, wedding receptions, festivals, launch events, funerals, ceremonies, anniversaries, parties, and many other special occasions. BABEL ROAMING are an ideal act if you are looking for an affordable live band. Like all of our artists they are professional, have all the relevant insurances and are always happy to chat to you about song requests and even DJ options after the performance. Many acts can provide background music throughout a dinner or lunch as well as provide the evening up beat entertainment too. Where can we book BABEL ROAMING? BABEL ROAMING can be booked throughout the UK in most towns and counties within reason. Please contact us via the booking form below for further information.